Home of "The Blue Stuff", Multicoat Corporation offers long-lasting pool deck resurfacing and basement waterproofing systems. We produce quality below grade waterproofing systems and durable pool deck paint for a great looking pool area. 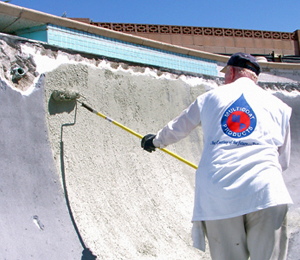 Multicoat Corporation stocks a variety of professional-grade synthetic stucco and concrete restoration systems that are easy to apply and rugged. We offer pool, deck, concrete, floor and wall coating materials, in addition to exterior stucco systems-coatings that combine long wearing finishes with upscale appearance. Multicoat Corporation is pleased to offer the best in coating systems for all your exterior, interior, and pool renovation needs. For over 20 years, Multicoat Corporation has maintained its reputation for providing the highest caliber of products to the construction industry worldwide.